The 80/20 Rule applies to time management books as well. 80% of your advertising results come from 20% of the ads you place. 80% of customer complaints are concerning the same 20% of your products or services. 20% of your networking gives you 80% of your referrals. 20% of the things you do produce 80% of your results. And so on. One of the points made is that – theoretically at least – you could eliminate 80 percent of the things you do and only sacrifice 20 percent of the results. If you could to do that, 80 percent of your precious time would be freed up to devote to more results-oriented pursuits. But what the workshop leaders fail to mention, is that their own books or training programs are not exempt from this principle. 20% of the ideas suggested in time management books or training programs represent 80 percent of the books’ or programs’ value. Those are the ideas that would make a significant impact on your effectiveness. 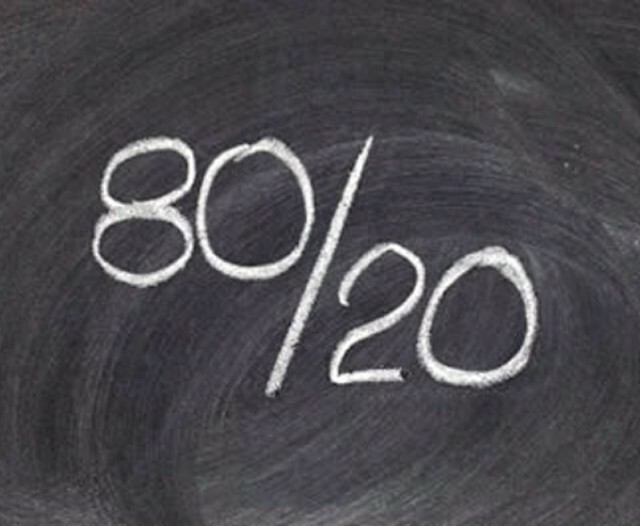 The other 80 percent are relatively unimportant, impractical, unworkable or undesirable. They all sound good and most of them make sense. For example, remove the chairs from your office because meetings get over faster when everyone is standing up. Handle each piece of paper only once. Don’t procrastinate. Keep a clean desk and work environment at all times. Use hands-free technology to respond to telephone calls while driving. Ad infinitum. The positive impact of these and hundreds of other suggestions is questionable. Some, like multitasking are downright dangerous. I have been presenting time management workshops for over thirty-five years. At the end of most workshops I asked people to record three of the best ideas. Then I asked them to return the form to me in four weeks, indicating the results obtained by putting those ideas into practice. Although less than 10 percent of the people returned the forms, it become obvious over the years that many of the ideas that are attractive to them are unworkable in practice. The ideas that actually improved productivity were generally those that addressed how they spent their time as opposed to how to be more efficient at what they were already doing. They are what I consider to be the macro time management ideas as opposed to the micro time management ones. People who have changed careers, started their own business, turned around a failing company, changed their lifestyle, resolved relationships, balanced their lives or developed life-changing habits are those who have been able to apply the macro time management suggestions. When reading books or taking courses on the topic of time management, we should focus on those suggestions that will improve our effectiveness rather than our efficiency. Efficiency is doing things in the best possible way, which is important; but not as important as doing the best possible things. Doing the best possible things – those macro time management actions – are the ones that will really make a difference. In the next blog article I will give a few examples of those ideas. You can probably guess what they are. Most of them are obvious. But although they are easy to recognize they can be difficult to execute since they require behavioral changes rather than just quick fixes.